Resides in Bani, DR in the offseason...Participated in the Tigers Winter Caravan and TigerFest. Spent most of the 2018 season with Triple A Toledo, playing in 123 games…also saw the first Major League action of his career, appearing in 27 games with the Tigers...Selected to the 2018 MLB SiriusXM Futures Game and started at third base for the World Team, going 1x2 with a run scored...Named to the International League Midseason All-Star Team...Hit safely in 14 straight games from May 22-June 5, hitting .302/.313/.444 with 11 runs scored, four doubles, one triple, one home run and six RBI...Finished the month of August hitting .300/.319/.382 with 13 runs scored, six doubles, one home run and 15 RBI in 27 games with Toledo...Made his Major League debut on August 30 at New York (AL) and notched a double in the sixth inning for his first Major League hit...Posted the second three-hit game and recorded the first RBI of his big league career on September 1 at New York (AL)…marked his second three-hit performance in the first four games of his Major League career, becoming the fourth Tiger since 1908 to accomplish the feat and the first since Tim Corcoran in 1977...Hit the first home run of his Major League career on September 28 at Milwaukee, blasting a two-run shot as a pinch hitter in the eighth inning… became the first Tiger to have his first big league homer come in a pinch-hitting role since Tyler Collins on September 1, 2014 at Cleveland...Played in 12 games with Tigres del Licey in the Dominican Winter League, hitting .234/.234/.298 with four runs scored, one double, one triple and five RBI. three triples, one home run and nine RBI during the streak...Ranked as the eighth-best prospect and rated as having the best infield arm in the Tigers organization by Baseball America following the season... Played in 19 games with Tigres del Licey in the Dominican Winter League, hitting .324 (24x74) with eight runs scored, four doubles and six RBI. Split the season between Single-A Adv. Visalia and Double-A Mobile, hitting .311 (152-for-488) with 23 doubles, 7 triples, 17 homers and 62 RBI...Named to the California League midseason All-Star Team...Played 101 games at third base and 24 at shortstop...Earned organizational Minor League Player-of-the-Month honors for May...Earned CL Player of the Week honors from June 27-July 3...Hit for the cycle on July 5 @ Lancaster...Played with Salt River in the Arizona Fall League and was named to the Fall Stars Team…earned AFL Player of the Week honors for Oct. 31-Nov. 5...Rated by Baseball America as the Best Defensive Third Baseman in the CL following the season...Entered the season rated by MLB.com as the D-backs' No. 17 prospect. Combined to bat .270 (125-for-463) with 16 doubles, 4 triples, 4 home runs and 47 RBI between Single-A Lansing, Single-A Dunedin and Single-A Kane County...Traded to the D-backs for INF Cliff Pennington on Aug. 8, 2015...Entered the season ranked by MLB.com as the Blue Jays' No. 12 prospect and No. 15 by Baseball America. Spent the entire season with Lansing, hitting .259 (123-for-474) with 17 doubles, 2 triples, 4 homers and 53 RBI...Tabbed by Baseball America as the No. 9 prospect in the Blue Jays' system prior to the season. Split the season between Rookie-Adv. Bluefi eld and Short-Season A Vancouver, batting .284 with 15 doubles, 7 home runs and 44 RBI. Made his professional debut with the Rookie Gulf Coast League Blue Jays, hitting, .224 (38-for-170) with 9 extra-base hits and 20 RBI in 47 games. Inbox: Who will start at 2B for the Tigers? 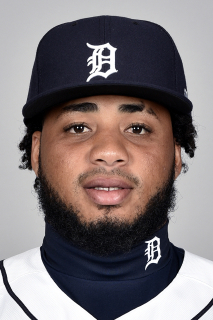 March 5, 2019 Detroit Tigers optioned 2B Dawel Lugo to Toledo Mud Hens. November 26, 2018 Tigres del Licey placed 3B Dawel Lugo on the reserve list. August 30, 2018 Detroit Tigers recalled 2B Dawel Lugo from Toledo Mud Hens. May 16, 2018 Detroit Tigers optioned 2B Dawel Lugo to Toledo Mud Hens. May 14, 2018 Detroit Tigers recalled Dawel Lugo from Toledo Mud Hens. March 6, 2018 Detroit Tigers optioned 2B Dawel Lugo to Toledo Mud Hens. October 24, 2017 3B Dawel Lugo assigned to Tigres del Licey. October 2, 2017 Detroit Tigers recalled Dawel Lugo from Erie SeaWolves. July 20, 2017 3B Dawel Lugo assigned to Erie SeaWolves. March 14, 2017 Arizona Diamondbacks optioned SS Dawel Lugo to Jackson Generals. January 12, 2017 SS Dawel Lugo assigned to Tigres del Licey. November 18, 2016 Arizona Diamondbacks selected the contract of Dawel Lugo from Jackson Generals. October 8, 2016 Salt River Rafters placed SS Dawel Lugo on the reserve list. July 10, 2016 Dawel Lugo assigned to Mobile BayBears from Visalia Rawhide. April 4, 2016 SS Dawel Lugo assigned to Visalia Rawhide from Kane County Cougars. April 1, 2016 SS Dawel Lugo assigned to Arizona Diamondbacks. August 9, 2015 SS Dawel Lugo assigned to Kane County Cougars. July 2, 2015 SS Dawel Lugo assigned to Lansing Lugnuts from Dunedin Blue Jays. April 9, 2015 SS Dawel Lugo assigned to Dunedin Blue Jays from Lansing Lugnuts. March 28, 2015 SS Dawel Lugo assigned to Toronto Blue Jays. March 31, 2014 SS Dawel Lugo assigned to Lansing Lugnuts from Vancouver Canadians. August 16, 2013 SS Dawel Lugo assigned to Vancouver Canadians from Bluefield Blue Jays. June 18, 2013 Dawel Lugo assigned to Bluefield Blue Jays from GCL Blue Jays. May 31, 2012 Dawel Lugo assigned to GCL Blue Jays from DSL Blue Jays. July 4, 2011 Toronto Blue Jays signed free agent SS Dawel Lugo to a minor league contract. July 4, 2011 Dawel Lugo assigned to DSL Blue Jays from Toronto Blue Jays.